New York: Gnome Press, . First edition. A near fine copy, lower corners slightly bumped, small discoloration line along cloth near lower edge from an old style dust jacket protector in a bright fine dust jacket, slight rub to upper right corner, touch of rubbing to spine ends. (10752). Octavo, cloth. Publisher file copy, noted on the front paste-down: "Gnome Press File Copy [signed] Martin Greenberg." 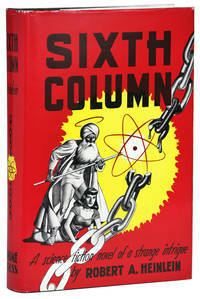 Science fiction novel in which the U.S. is conquered by Asia and a small group of scientists plot to save the country.